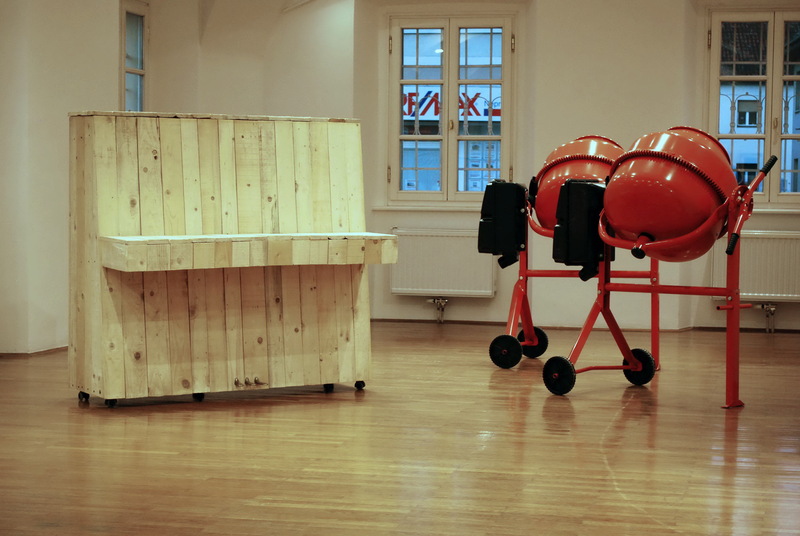 Installation Concert for a pianino and two concrete mixers II. 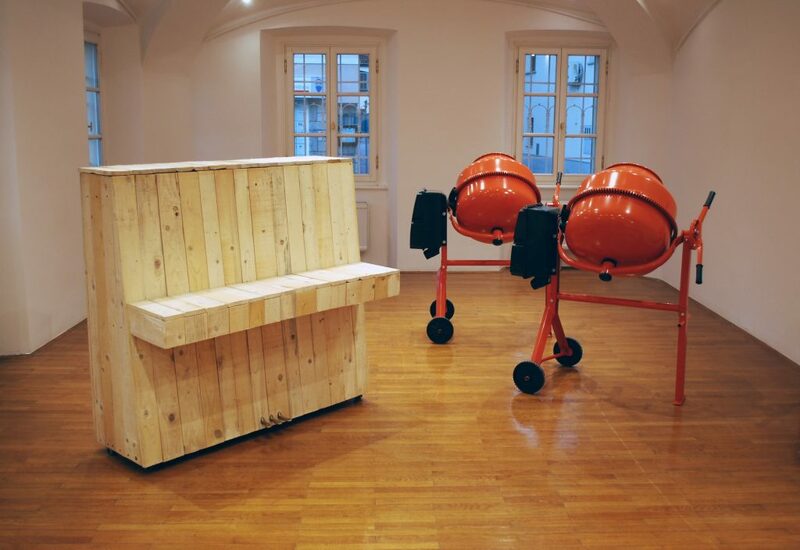 consists of three objects, a pianino and two concrete mixers, and is accompanied by a musical work in which the sounds of an operating mixer are intertwined with a piano composition. 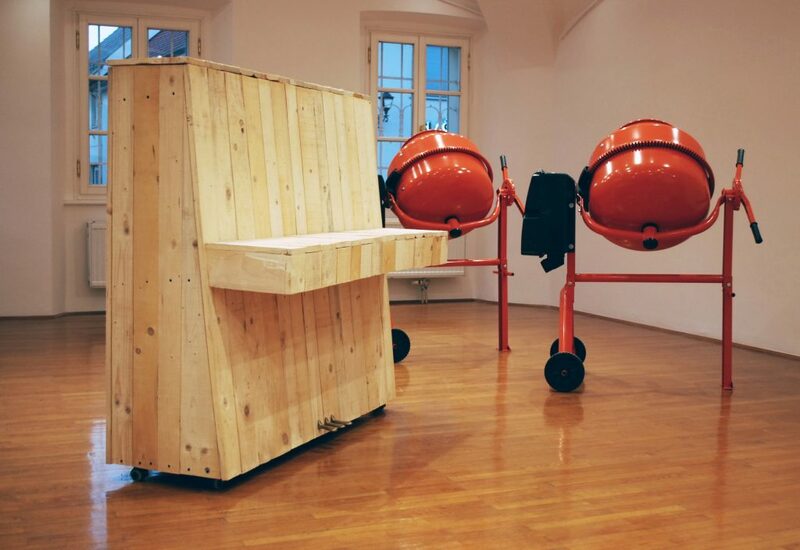 On the one hand, the objects – the mixers, which came to the exhibition straight from a factory, and a box-like pianino, made of wooden boards – are presented in a real(istic) manner. 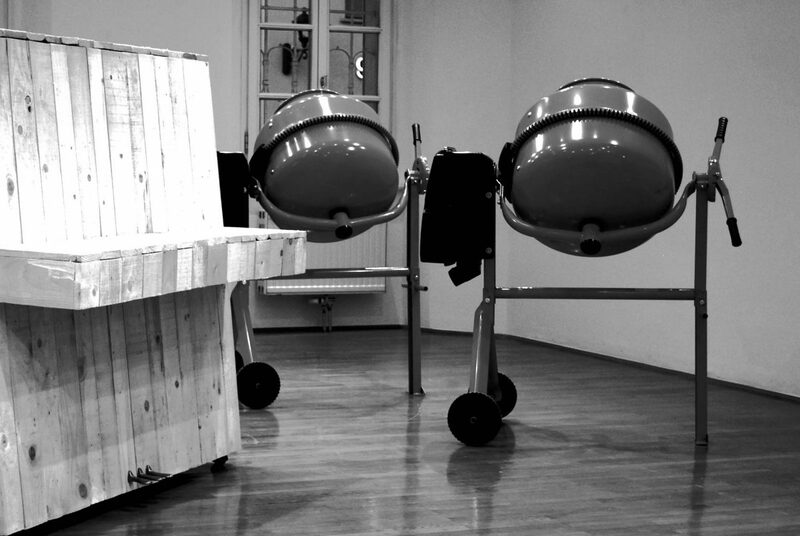 On the other hand, they are presented in an abstract manner, as metal constructions, with a concrete block representing the mixer and three pedals standing in for the piano. Both installations, albeit each in its own way, deal with a specific phenomenon, typical of the Slovenian society in the second half of the 20th century, which resulted from the vigorous activity in the building industry on the one hand and from the boom in the field of music on the other hand. The building industry first thrived in public space, for in the 1950s and 1960s numerous blocks of flats, public buildings and roads were built, in many cases by means of self-imposed financial contribution and citizens’ work actions. In the 1970s and 1980s, this was followed by the blossoming of the construction of private single-family house, often in the form of self-construction, whose consequence is the fact that many a household, including the artist’s parents’ home, still has a concrete mixer as part of its permanent hardware. In parallel with this process, there was vibrant activity going on in the field of music, which is why one of the best music education systems in the world was developed in Slovenia. This process included the project of establishing a system of public music schools, which is well illustrated by the exclamation “Give us a good piano!” published in mid-1950s in the daily newspaper Dnevnik. In fact, the piano was the most popular musical instrument in music schools throughout the entire period of socialism. However, since most people could not afford to buy a real piano, they settled for a pianino, which, after having served its primary purpose, became a convenient shelf for putting aside photographs, souvenirs and other smaller objects. As this short excursion into history has demonstrated, the pianino and the mixer have become, together or separately, part of the permanent household inventory due to the specific social conditions in the second part of the 20th century. Today they act as the phenomenon that represents that time, regardless of the differing opinions about it, as the time of social equality, wide accessibility of goods and services and, above all, the time of large-scale ambition and vision, so sorely lacking in the modest present-day state.